God is a relationship of Father, Son and Holy Spirit. The only being worthy of our worship, God is our Creator, Redeemer and Friend. There is one God: Father, Son, and Holy Spirit, a unity of three coeternal Persons. Let’s go through each paragraph in the section entitled “Misrepresentations of the Godhead” to see if the Trinity understanding of God harmonizes with what has been written by Ellen White. Question: What did Martha say that confessed her faith in Christ’s divinity? Proclaiming that Jesus Christ is the Son of God is a way to confess belief in Christ’s divinity. Christ being God’s only begotten Son is connected with His divinity. Question: Do Seventh-day Adventist non-trinitarians believe in the divinity of Christ? Answer: Yes, SDA non-trinitarians believe that the Son of God is truly the divine Son of God. Question: What was one way to deny the divinity of Christ back in 1884? Answer: Declaring that the Son of God had no existence prior to his first advent to this world denied the divinity of Christ. In other words the divinity of Christ is connected with his pre-existence. If you didn’t believe Jesus pre-existed prior to his first advent then you did not believe that Jesus was divine. Question: Do non-trinitarians deny the divinity of Christ? Question: What does it mean to believe in Christ’s pre-existence? Answer: It means to believe in Christ’s existence before He came to our world and it means to believe in Christ’s existence before the world was made. Question: Do Seventh-day Adventist non-trinitarians believe in Christ’s pre-existence? Answer: Yes. SDA non-trinitarians believe that Jesus Christ existed before He came to our world and that He did exist before the world was made. Notice how the “divinity of Christ” and Him being the “Son of God” are connected. Satan doubted Christ’s divinity and wanted proof of His divinity. What evidence was Satan looking for? Satan demanded of Christ evidences of Him being the Son of God. Question: How does Ellen White go about proving that Seventh-day Adventist’s believe in the divinity of Christ? Answer: By holding firmly to the truth of Christ’s pre-existence. Question: What should we teach people to keep them from the error of believing that Jesus was not divine? 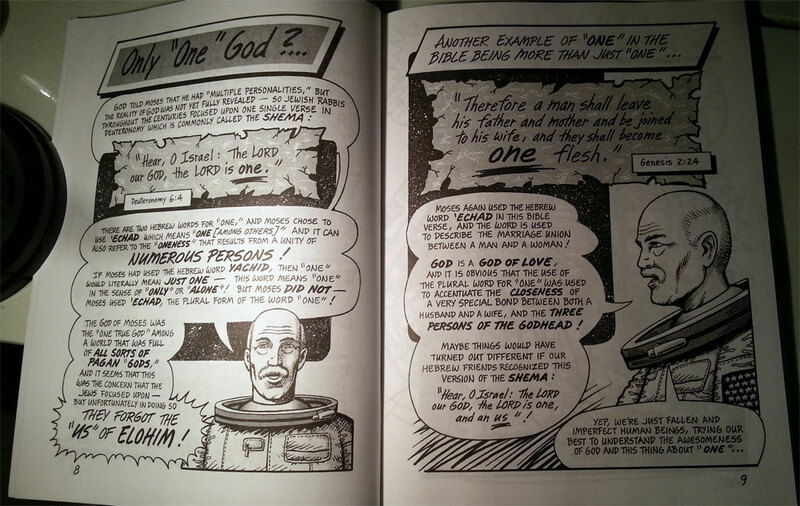 Answer: Teach men of the pre-existence of the only Saviour of the world. Question: Was it his human nature or his divine nature that Jesus was declared to be the Son of God? Answer: In His divine nature Jesus was declared to be the Son of God. Question: Is Jesus Christ the divine Son of God? Answer: Yes, Jesus Christ is truly the divine Son of God. Jesus is divine. Jesus is a Son. Jesus is God’s very own Son. Question: Does the Trinity doctrine make God, Christ and the Holy Spirit one being? Answer: Yes, God and Christ lose their distinct personages as Ellen White has mentioned. The Father, Son and Holy Spirit become one being. Question: Doe the Trinity doctrine make the Son of God a nonentity? Answer: Yes, here are three reasons why I believe the Trinity doctrine is a deception of the enemy that has crept into the church. 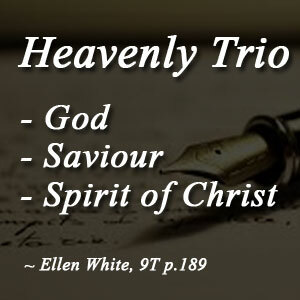 Heavenly Trio Article – Ellen White talks about the “heavenly trio”, “the eternal heavenly dignitaries” or “three highest powers in heaven.” Are these trinitarian phrases? Question: Does the phrase “heavenly trio” imply that God is one being who is three persons (1-in-3)? Answer: No, God is a personal being. In Hebrews chapter one you can see that God is identified in the singular and not in the plural. God is a personal being. 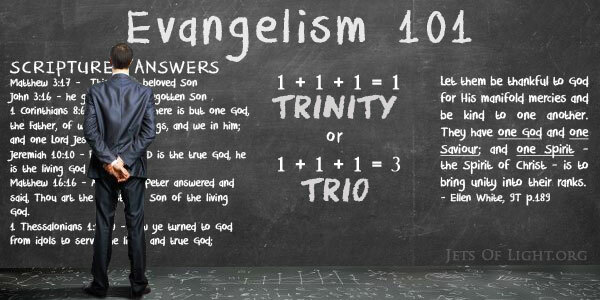 There is no hint of a God who is a Trinity. Trio is not the same as Trinity. Question: Where in the Bible do we see an example of the pronoun “He” being referred to the Father, Son and the Holy Spirit? Answer: I have not found anywhere in Scripture which references the Father, Son and Holy Spirit by using the pronoun “He.” Using the pronoun “He” to talk about the Father, Son and Holy Spirit changes the identity of God. Question: How is Jesus Christ identified in this paragraph? 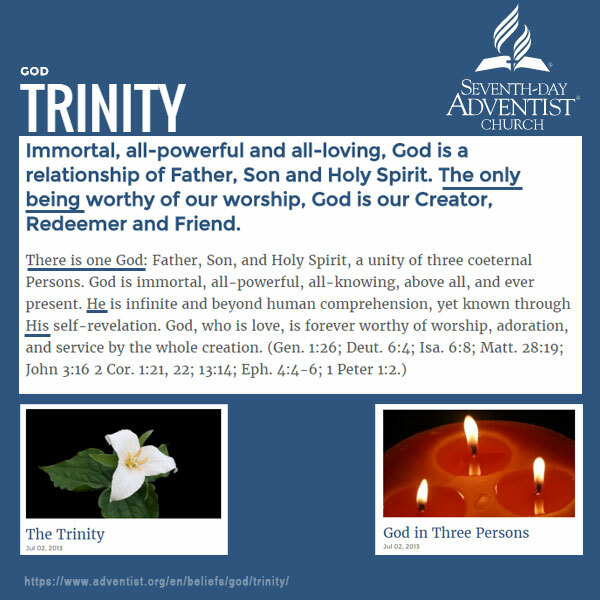 The Trinity belief about God trys to define God as one God in three persons. Ellen White on the other hand clearly reveals that God and Christ are two different beings. The heavenly trio is never defined by Ellen White as a unity of three co-eternal persons. Question: How is the Holy Spirit identified in this paragraph? Answer: The Holy Spirit is identified as the Comforter and is the Spirit in all the fullness of the Godhead, making manifest the power of divine grace. Question: Who is the comforter? For a more detailed study, visit the Trinity Truth article about who is the comforter. Christ’s words were spoken with a quiet dignity and with an assurance and power that sent conviction to the hearts of the scribes and Pharisees. They felt the power of the message sent from heaven. God was knocking at the door of their hearts, entreating entrance. But they refused to listen. By their persistent rejection of warnings and invitations they caused Him to abandon them to their blindness and its results. Satan was working with all his power to secure them in his cause, and under his control they developed a stubbornness which brought upon them their ruin. The Holy Spirit, which proceeds from the only begotten Son of God, binds the human agent, body, soul, and spirit, to the perfect, divine-human nature of Christ. This union is represented by the union of the vine and the branches. Finite man is united to the manhood of Christ. Through faith human nature is assimilated with Christ’s nature. We are made one with God in Christ. May 3, 1899 The Word Made Flesh. Answer: Ellen White used the word pre-existence in relation to believing in Christ’s existence before He came to our world and to believe in Christ’s existence before the world was made. Seventh-day Adventist non-trinitarians believe that the divine Son of God has pre-existence and self-existence. One does not need to believe in the Trinity to believe in Christ’s pre-existence and self-existence. Question: Where did the self-existent Son’s self-existence come from? Answer: The glory of the eternal, self-existent One (the Father) encircled both. Christ is the self-existent Son because His Father is the self-existent One. Christ is the self-existent Son of God, begotten with the immortal life of His Father. It is a great practice when trying to understand what Ellen White was saying to search for other references of the same expression. Here are two quotes below that help to explain life, original, unborrowed, underived. Question: Is the life that is original, unborrowed, underived inherent in man? Answer: Yes. It is given him as a free gift if he will believe in Christ as His personal Saviour. The expression “Christ and the Father” is common in Ellen White’s writings. This expression is not evidence of the Trinity doctrine. Here are a few other quotes with the same expression for your reference. Who are the two beings that we need greater faith in? Who are continually working through the laws of nature? The subtitle “The Eternal Dignitaries of the Trinity” was not added by Ellen White. This is an addition to Ellen White’s writing and it is very revealing. Whoever wrote this subtitle desired you to read the quoted paragraph through a Trinitarian lens. Question: Who is the vast confederacy of evil arrayed against? Answer: “against God, against Christ, against all who unite with these holy powers.” MS130-1901.52 Two beings are being referenced. There is no reference to a third being. A simple explanation of these phrases can be found in our previous article on the “heavenly trio” expression. Point (A) – Who is this person? Point (A) – Who does Ellen White say this person is? Point (A) – Who is the third person of the Godhead? Answer: The third person of the Godhead is the Holy Spirit. This is what the paragraph explains. We also know that Ellen White’s letter 66 reveals who the Holy Spirit is. As It Reads has a good explanation going into more detail on the third person of the Godhead. Point (A) – Are the three highest powers in heaven a Trinity? Answer: No. The heavenly trio article addresses who these powers are. In closing there are many people who will reject this information not because the information presented is wrong but on the implications of how it could affect their life if they accept that the official Seventh-day Adventist doctrine on God is wrong. When a person stands for truth many times there comes a cost to obeying that truth. Someone who finds the truth about God may lose friends in the church. If the person is a SDA pastor he may lose his job for rejecting the Trinity doctrine. Someone who is in a self-supporting ministry may be asked to leave the ministry. The good news is that when a person decides to obey the truth no matter the cost a wonderful experience can take place that you wouldn’t want to trade for the world. Sacrifice, persecution, ridicule or even loneliness becomes small in comparison to the great gain of connecting with “the only true God and Jesus Christ whom thou hast sent.” I have experienced this blessing. I wouldn’t trade this truth for anything. It’s been a joy to understand the truth about God. This is why I have written this post. I hope you will consider the things written and not discount them perhaps even unconsciously because of the sacrifice that may be called for. The sacrifice is worth it. I’m on the other side saying come on over. There is victory on this side. There is a joy and strength that by God’s grace will see us through until the end. Whoever you are that is reading this article right now, please make a decision and choose the truth about God over the lie. Jesus is truly the Son of God. God is truly the Father of Christ. The holy spirit is truly the spirit of Christ. Matthew 16:13-17 When Jesus came into the coasts of Caesarea Philippi, he asked his disciples, saying, Whom do men say that I the Son of man am? 14 And they said, Some say that thou art John the Baptist: some, Elias; and others, Jeremias, or one of the prophets. 15 He saith unto them, But whom say ye that I am? 16 And Simon Peter answered and said, Thou art the Christ, the Son of the living God. 17 And Jesus answered and said unto him, Blessed art thou, Simon Barjona: for flesh and blood hath not revealed it unto thee, but my Father which is in heaven.